YOU ARE NOT A WOLF. This is the land of wolves. After watching 'Mad Max: Fury Road' I was convinced that I wouldn't see another five star film this year. I was wrong. 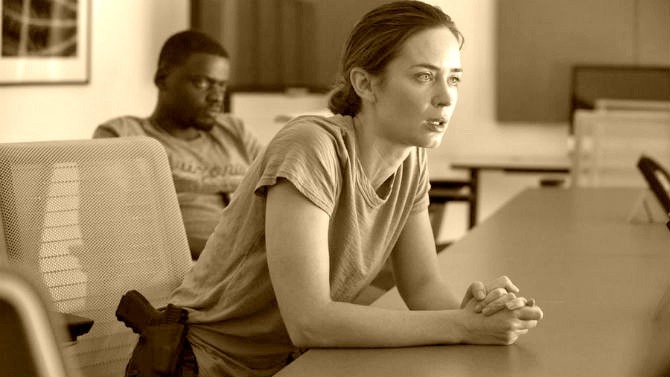 Flawlessly directed by Denis Villeneuve ('Enemy' and 'Prisoners'), 'Sicario' draws you in with the very first scene of Kate Macer (Emily Blunt) and her partner Reggie Wayne (Daniel Kaluuya) leading a FBI kidnap recovery team into a den of death right on American soil. Their team uncovers a cartel house in suburban Arizona that has 42 bodies buried in the walls. It's a sickening sight that only gets worse as the film wears on. From the moment the swat team bursts into the hell house until the final scene, there is a palatable tension laced throughout the film. The terror is so tangible that I sat on the edge of my seat as if I were watching a horror movie, because that's what 'Sicario' feels like...a horror movie with real-life monsters. YOU'RE ASKING ME HOW THE WATCH IS MADE. For now just keep your eye on the time. Kate and Reggie are basically "door kickers." Each time they kick one down another door pops up. They're putting bandaids on open bullet wounds and not making much of a difference against the cartel. When an opportunity presents itself for Kate to work with an elite unit that brings the fight to the cartel, she takes it. Matt Graver (Josh Brolin) serves as a "U.S. Department of Defense liaison," but in reality he's a CIA operative with a hired assassin Alejandro, brilliantly portrayed by Benicio Del Toro. Matt is reluctant to trust Reggie, as Reggie has a law degree. He tells the Arizona FBI Office that "there are no lawyers needed" on these excursions. Who do you work for now? Matt takes Kate into the heart of the beast, Juarez, Mexico, where it's so deadly that the U.S. Marshalls have to be escorted by Delta Force operatives, who are in turn escorted by the Mexican Federales. The unit gets into a fire fight with cartel operatives attempting to prevent them from taking the cartel boss' brother (or cousin I can't remember which). It's Kate's first glimpse of the CIA's deep involvement in the drug war and one that she doesn't like the taste of. This is not what I do. Kate is a good FBI agent desperately trying to navigate the waters between legal and illegal, whereas Matt and Alejandro try to invent ways to break the law. Kate is never quite sure of the CIA's murky motives until the very end of the film and by that time it's too late. The dynamics of having a woman embedded in this world of alpha males was a unique perspective, which would have been diminished had the producers got their way and made Kate's role male. 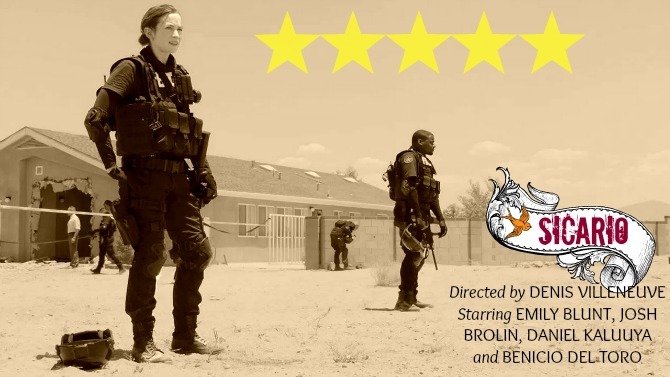 'Sicario' does not pass the Bechdel test but it succeeds where so many other films fail by making Blunt's character vulnerable but tough, frightened, yet competent. 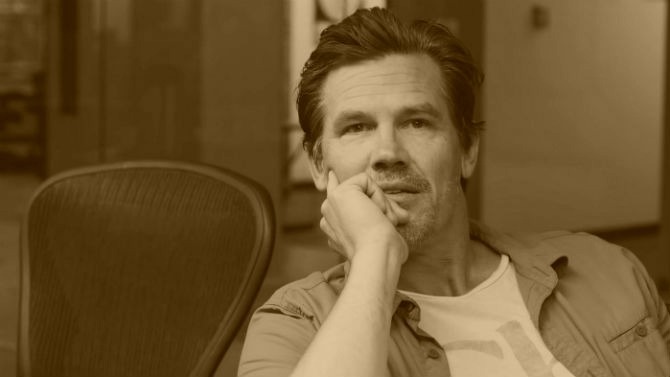 A lesser film would have tried to create a romance between Kate and Alejandro, but script writer Taylor Sheridan knew better. The developing relationship between them is tender, but is not sexual. 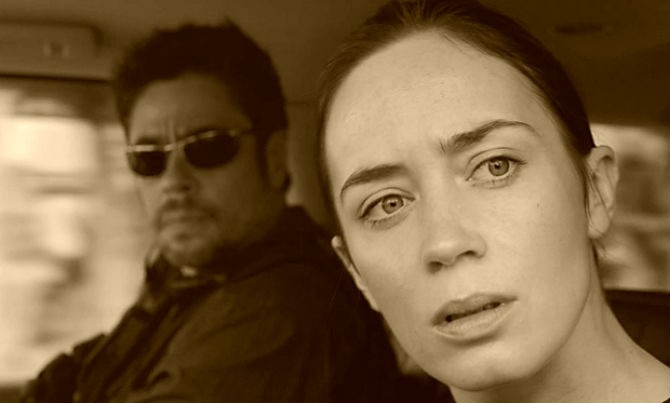 Another interesting aspect about 'Sicario' is how the violence is handled. I don't like seeing gratuitous violence in films. In fact, I avoid violent movies. What was so surprising was that in a film about a drug cartel, most of the violence in 'Sicario' takes place off screen. It's a very smart move on the part of the director. There are some horrific scenes, which show the aftereffects, but for the most part the violence is not shown and it doesn't need to be. The threat of violence and danger is always present and that's what's chilling. To work this side of the fence. Del Toro's performance as the deadpan brutal hitman is exquisite: his timing, his mannerisms, his eyes, everything. When you discover the heinous loss he endured, one could almost understand why Alejandro became what he did. Blunt is exceptional as well. A lesser actor wouldn't have been able to capture the subtle nuances of Kate's descent into darkness. Brolin is great too, but Del Toro steals every scene he's in. I would note that Blunt and Del Toro appeared together previously in 'Wolfman,' which I totally forgot about. Their chemistry together was quite good. The music is also exceptional and eerie, setting the dour mood. Perhaps the main star of the film is Villeneuve's direction, which is impeccable. From the sweeping aerial scenes, to the 'Zero Dark Thirty' gun battles, to the waves of emotion overwhelming the characters, Villeneuve doesn't miss a beat. 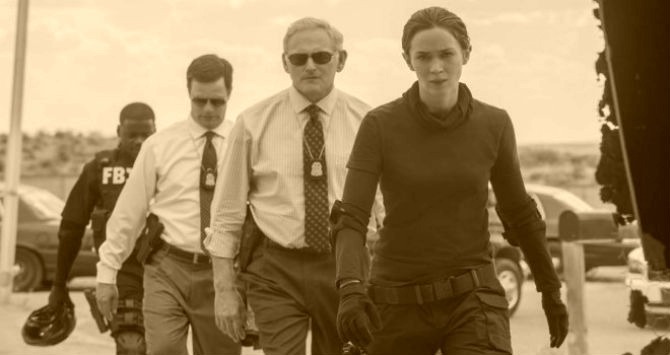 'Sicario' is a riveting thriller and certainly one of the best films of the year. My feelings exactly. And it built tension even when there was none. I think this one will be up for several Oscars. And sorry, saw Crimson Peak last night. Not del Toro's best work, but I really dug it. Really? I thought it was so predictable. I did love Sicario though! It was absolutely fantastic. Looking forward to seeing this, good review! Oh I think you will love this film. It's wonderful. Great review! I loved this film. It was such a pleasant surprise for me because it wasn't on my radar at all until recently. And the cinematography was so beyond belief gorgeous. It wasn't one I was going to see. I thought it was going to be too violent, but it wasn't. I loved this movie. I totally missed this one but it sounds amazing. Surprisingly enough I do watch movies without superheroes. :) You always make insightful reviews Ms Mariah. Thank you! Oh you should see it! I think you will really love it. Ha, I know you watch all types of movies! Ha, ha. Yes, it had some really creepy bits, but it is so worth seeing! Love, love, loved this movie. Oh I live this review, you do such a wonderful job at them. I will have to see this for sure. Sounds thrilling! Thank you! It was very thrilling! I hope you enjoy it! Ha, yes 'Wolfman' was a totally forgettable movie wasn't it! I think I just about fell through the floor when it was revealed what happened to him. It was amazing how two sentences affected me. I was so upset by that. Wow, what a powerful film! I was going to avoid this one but you convinced me to see it. I also really enjoy the way you design your reviews with the addition of the quotes. This is great stuff. Awww, thank you so much! You should totally see it! It was fantastic. I'm so out of touch, this is the first time I've even heard of this move. Sounds visceral. Oh it was! That's the perfect word for it! I wish I would have used that word in my review! I'm glad you loved the movie, and "horror movie with real-life monsters" is a great description in your review. I could see how someone who lives in the US could have a more emotional investment in the war on drugs, because its closer to home. (I live in Europe). ps You might want to add a spoiler warning about the twist( your last paragraph). Most modern movies can be trimmed by 15 minutes. In general I think today's movies are about 15 to 30 minutes too long. 1-1/2 hours or 1 hour and 45 minutes is the perfect length of a film..IMO. But this film's length didn't bother me because I felt the film was well-paced. I don't think I revealed anything in the last paragraph that isn't evident from the trailer. It's clear in the trailer that he's some sort of assassin. Just so you know, it was the word "loss" I felt was a bit spoiler-y for those who haven't seen the movie yet. Enjoy your reviews. I can understand what you're saying, but I didn't reveal what it was. I think I used a very general term. I'm going to see this one in the next couple of days. Thanks so much for this post about it. It only makes me more excited about seeing it. Oh it was wonderful. It's my second favorite film this year. The first being Mad Max. 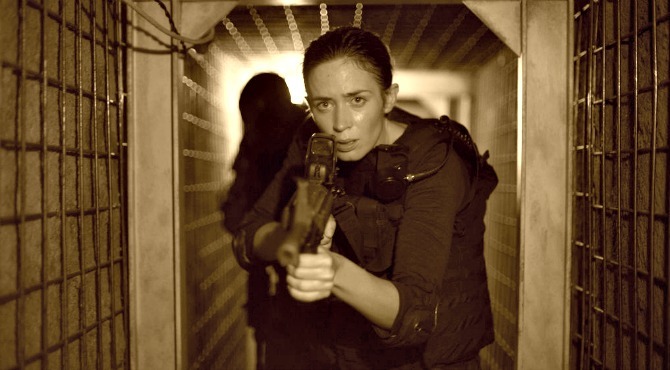 I just read your review, but saw Sicario in the cinema and many times since, it's one of my favourite films. I love your review, what you say about the tension and oppressive horror-style atmosphere is spot on. The first time i watched it i was sinking further into my seat as it went on, it was almost unbearably tense in parts. Del Toro was robbed of an Oscar, he was just superb, as all the actors were. Just a fantastic film, and i can't wait to see the sequel, Soldado, next year. Thanks for the great review! Thank you so much for you kind words. I really enjoyed this movie. I've seen it several time since my original review. I recently saw a behind the scenes clip about how they built the tension in the film...and the music. Supposedly the composer took his queue from the film 'Jaws.' I thought that was quite clever.